new 40m scale model – Superyachts News, Luxury Yachts, Charter & Yachts for Sale. 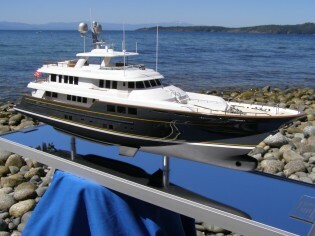 1:60 scale model of the RMK built/Ron Holland designed 40m “Calliope”. This whole hull model measures 30″ long and moderately detailed with laser cut decking, cast fittings and chromed details. So, what can we build for you?